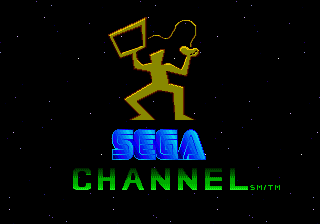 The Sega Channel was Sega's early attempt at a broadband media delivery service. It provided a continuously looping one-way stream of data on a hidden channel which the Sega Channel tuner would "catch" and then download to its internal memory for usage. New streams were provided monthly to the user at a cost of roughly $15 per month (about $25 when adjusted for inflation). Although it caught on almost exclusively in the United States, it was instrumental in later broadband Internet deployment by encouraging participating cable operators to upgrade and maintain their systems for cleaner digital delivery. This article covers both the Scientific Atlanta and General Instrument versions of the Sega Channel. A compilation date can be seen at 0x200 in both versions. Present at 0x12B99 in the Scientific Atlanta version and at 0x11D91 in the General Instrument version is a compiler error that somehow made it into the ROM. Starting at offset 0xCDDE (Scientific Atlanta) or 0xB707 (General Instrument) is a large chunk of credits, followed by an odd comment about fast-food catering, a fan club address (with the developers replacing vital information with X's), and a copyright notice. Likely present to fill space before data was downloaded from the cable operator, or maybe just for testing. Curiously, ticker five line one includes an extra "WO" in its text. This can be found at 0x2C3A in the Scientific Atlanta version, while it's at 0x2C3E in the General Instrument version. Generic error messages, possibly displayed in operation if a serious error occurred, or simply used during debugging. This text is at 0x32E1 in the Scientific Atlanta version before the diagnostic tools text, but at 0xEBC5 in the General Instrument version after the diagnostic tool text. Possibly meant for cable operators to provide remote support using equipment at the headend, pieces of a remote diagnostic tool are located starting at offset 0x34DF. What could be done remotely, if anything, is unclear, although some of the text indicates the existence of a downlink test that would fill RAM with dummy data, and a debug display that would list the contents of the 68000 registers and stack pointer. This diagnostic tool appears to be for developers, as it gives out the internal registers within the Sega Channel cartridge and also returns the value of the game downloaded. It begins at 0xA32C in the ROM. There's also a small DRAM writing test at 0xAD24. Compared to the Scientific Atlanta version, the General Instrument version is significantly simpler. Text for a diagnostic screen can be seen in the ROM at 0x4E90. There's also text for a more succinct download diagnostic program at 0xEDC3. This page was last modified on 3 October 2018, at 18:17.